Between all of the holiday roasts, sides, fishes, cookies and pies, it’s easy to overlook preparing a delicious breakfast for your family and houseguests. This holiday season, IMUSA’s recipe for a Chorizo Scrambled Egg Breakfast Taco has you covered. IMUSA, leader in Hispanic cookware, combines chorizo, lime juice, eggs and cheese (among other ingredients) to make an outstanding breakfast taco that your guests will remember. With this breakfast your holidays is sure to be great from the moment you wake up. Mix sour cream, lime juice, and salt in a bowl and put aside. Char tortillas over gas flame or directly on electric burner until blackened in spots, turning with tongs. Place in IMUSA tortilla warmer or aluminum foil and set aside. Cook for 5-6 minutes until chorizo is browned. Add half of the cilantro and all of the cooked chorizo to beaten eggs and mix. Bring eggs back to the IMUSA pan and cook on low heat, mixing from time to time. Place cooked eggs, cheddar cheese, diced tomatoes and remaining cilantro in separate bowls and lay them out throughout the table with the warm tortillas. 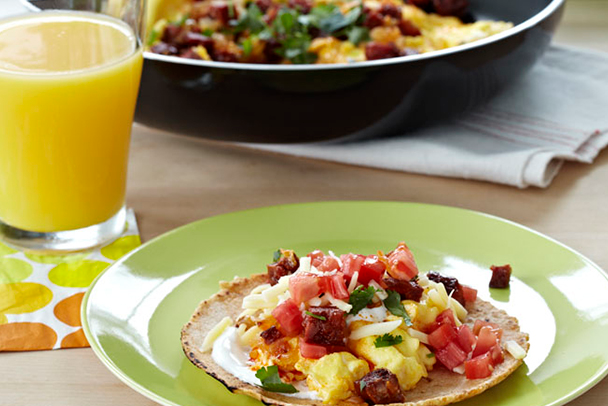 Allow your guests to assemble their own breakfast tacos.